Such was the case for Corey Payette, who decided to honour his Oji-Cree heritage from northern Ontario by writing and directing a powerful piece of musical theatre that explores the system’s dark issues while ultimately being a healing journey. 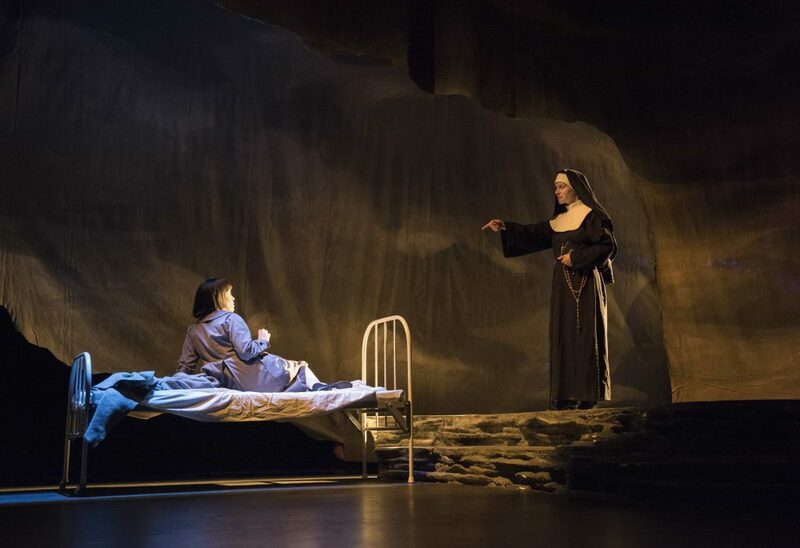 Children of God has been playing to critical acclaim and sold-out venues across Canada since its Vancouver premiere in 2017, recently completing a triumphant run at Montreal’s Segal Centre. It highlights the intergenerational impact of the system by alternating between siblings Tommy (Dillan Chiblow) and Julia (Cheyenne Scott) in a 1950s church-run school and the enduring effects 20 years later. When Payette began writing the script and music over a seven-year period, it came from a place of anger and frustration that this history has been so long suppressed. During the discussion that follows each performance, an audience member from the Segal Centre’s predominantly Jewish audience suggested it was if the Holocaust had been silenced for generations. The play evolved over time through conversations with Elders, who stressed the importance of forgiveness and how it helped save their lives and those of their families. Classmates who didn’t embark on this healing journey often couldn’t survive the pain of their experiences. He says that is why the ending is so powerful. It depicts that strength, that all the horrific things that happened don’t define the survivors and their families. The resulting production is theatre of the highest calibre, featuring a compelling story, beautiful music and moving performances from its cast, including seven Indigenous actors who each have their own connection with residential-school history. Payette feels the weight of the material elevates the contributions of everyone involved, both those who have been with the show for five years and more recent additions like Michelle St. John, who conveys heartbreak and heroism as the mother whose children have been taken away. “We’re all being changed by the work, getting a chance to share these stories that are so meaningful to us and helping to ensure that the next generation of (Indigenous) artists have roles to play,” Payette asserted. Each character demonstrates charisma and complexity, with even the church’s authority figures portrayed with conflicted humanity. Elders and emotional support workers helped the cast cope with the difficult subject matter during rehearsals, which were initially held in a former residential school in Kamloops, BC. 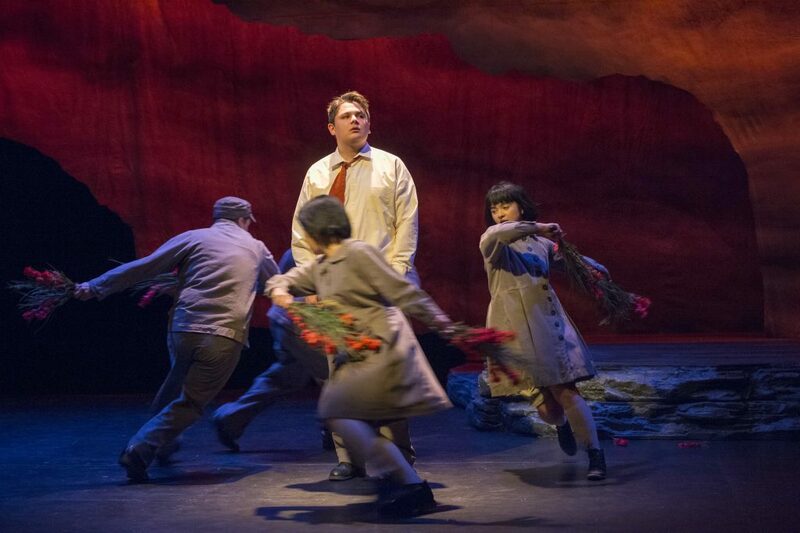 While the show doesn’t shy away from issues like child abuse, pedophilia and suicide – audiences are encouraged to retreat to the foyer’s designated safe space if it becomes overwhelming – the gorgeous melodies and choreography soften some of these jagged edges while inspiring a more visceral connection to the characters. With much of the story seen through the eyes of children, the music also expresses thoughts and emotions that can’t be spoken. Along with the sadness and anger is plenty of laughter and playfulness, as when the kids sneak apples or plan escapes from their captivity. In some scenes, they are jumping around listening to The Lone Ranger theme or turning bed sheets into dancing props. During Payette’s research, Elders told him that song and dance were at times their only refuge from the ordeals they faced. While some have found it incongruous to make a musical out of such source material, these Elders thought it was a perfect pairing because music is healing. The music in Children of God supports the story in numerous ways, enabling fluid transitions between space and time that sometimes feels dreamlike. In one haunting example, the children form a triangle with their mother, singing “Why Did You Send Us Away?” even though she is far from the school. When the boys defiantly sing “What Do They Take Us For?” it comes from feeling underestimated. But the wider implication is the incomprehensibility of the system itself. In another song, it is the nun’s punishing ruler providing the percussion. Payette worked with an Ojibwe actress to develop the lyrics for the powerful finale, in which the mother leads the cast in an anthemic tribute to First Nations resilience. Payette has witnessed the profound impact this show is having on both Indigenous audiences and others who hadn’t even heard of residential schools. Although it will go on hiatus following an upcoming tour of rural BC, he hopes to eventually hit every part of Canada and urges anyone wanting the show should reach out to his company, Urban Ink. There is healing to be had. There is an importance to a complete experience and the process that goes with it. Well done. The heaviness lifts from the audience. It is with reluctance I enter a theatre, the Segal Centre in Montreal on an uncommonly warm winter evening. I love plays and artistic productions, but tonight is a musical. The subject matter is dark and sombre – residential schools. How can one make a musical about such a horrific period in Canadian history? The torture and victimization of thousands of children by the government and churches. This will not be a journey like Mamma Mia or Beauty and the Beast. Tonight, I am in the company of amazing people. Those who have real experiences, and have come to see what this production is all about. The theatre has set up emotional support for those who need to leave. The musical is from the mind of Corey Payette, and titled Children of God. It does not take long to link the name since the opening is set in a church-controlled residential school with strict and morally deficient authorities overseeing young children. The songs tell the stories of children finding joy in each other and reflection of their lives with their parents in their communities and lands. There is always the hope that their parents will show up to take them home. Yet, at the gates, parent after parent is turned away with threats of imprisonment should they persist in trying to get their children back. And it begins. The songs are well done; the darkness and truth of a bleak history unfold. A sense of injustice and arrogance permeates the air. A sense of a great wrong done, and a story left unfinished. Smatterings of private joyful moments as children sneak away to spend some time together to support each other. They are too few and short-lived. Reality and violence come all too soon and often. A short intermission lets people stretch and breathe. Some people had the look of a deer in bright headlights, a little shocked and hesitant of what to do next. Then, the lights go down again and we are back in our seats. The second half seems to fly by. The cast continues to convey their messages through song – more tragedy and tears – then suddenly I find myself standing holding the hands of audience members beside me as an Ojibwe blessing song is sung. There has been learning and tears. Within minutes we have come full circle. We are ready to leave should we wish. But we do not move. It is late, but there is a dialogue portion of the evening to answer questions from the audience. The emotional support worker sets up three seats at the front of the stage, taking one, as two of the Indigenous actors – Michelle Bardach and Dillan Chiblow – come out and sit in the other two. The questions begin, it is clear some audience members have come to learn with little to no knowledge of Indigenous Peoples, let alone an era of residential schools. Questions come fast and are broad about Indigenous Peoples that do not seem like they are related to the musical. Are all Indigenous Peoples in the world not related somehow? How many are there? How many Truth and Reconciliation Commissions have occurred in the world to date and what were the results? I wonder if I was in the same room as them for the last two hours. I must have missed the university lecture portion of the program – a quick comment sums up that the Canadian education system lacks quality curriculum on Indigenous Peoples. Then, the dialogue takes a turn. An Indigenous woman talks of how the events and feelings portrayed in the musical reflect her experiences in the school. She had come to see what their interpretation would be, and to her they accomplished something good. Another Indigenous woman breaks down to say she was taken away, never to return home. She was given to a family who changed her name and raised her far from her culture and people. She never knew them. A third Indigenous woman looks at one of the actors and asks, “Do you know this person?” They answer, “Yes, that’s my mom.” It’s a small world, maybe we are all related. If that were true, I would have some 370 million family members. I don’t think there’s enough geese left in my freezer for a family reunion. We stand and do a closing song. We have to. We stayed. So, I walk out of the theatre. A night well spent with some incredible people. An experience shared. So, would I say Children of God evoked emotions? Yes. Did I learn something? Nothing was new, but unlike most of the audience I was at the Truth and Reconciliation Commission hearings. It was a brush stroke on a deployable history. But it evoked thought, and for some in my group, it was their second time. Before I go to bed, I sent a quick message to one of the actors – well done.